Individually wrapped. 110 calories. Real milk chocolate. No artificial flavors. Artisan baked. Italian inspired. Est 1988. 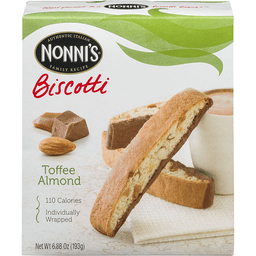 Treat yourself to a Nonni's biscotti break! Facebook: Share your favorite biscotti break on Facebook. From Family Tradition to Artisan Bakery Delights: The story of Nonni's began in the Tuscan town of Lucca, Italy. 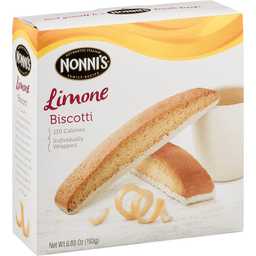 That's where our founder's beloved grandmother known as Nonni first baked her delicious biscotti using only real, hand picked ingredients from her local market. When he opened his artisan bakery in 1988 called Nonni's, of course he followed his grandmother's recipes and uncompromising quality standards. Today our bakers are inspired to follow Nonni's old world traditions in preparing a variety of delicious treats using real quality ingredients. No artificial flavors or preservatives. Just one taste and you will understand that nobody treats you like Nonni's! If you have any questions or comments, please call us at 1-877-295-9604. Visit our website at www.nonnis.com. Real, wholesome ingredients. Baked by real bakers. Made with real eggs, sugar and butter. Baked twice for a light, crunchy texture that's delicately sweet and satisfying. 100% recycled paperboard. Minimum 35% post-consumer content.